Do you love a life of adventure? Do you wish to emback on adventure filled with exitement and challanges? if so, take your next adventure to Africa’s oldest national park “Virunga National Parks” and meet with the Virunga mountain gorillas. Virunga national park was founded primarily to protect the mountain gorillas living in the forests of the Virunga Mountains controlled by the Belgian Congo, but later expanded north to include the Rwindi Plains, Lake Edward and the Rwenzori Mountains in the far north. Located in the Democratic Republic of the Congo, Virunga National Park is a UNESCO World Heritage Site in the eastern Democratic Republic of Congo, on the border of Uganda and Rwanda. Virunga is Africa’s oldest national park and is also the continent’s most biologically diverse protected area. The park’s 7800 square kilometers (3000 square miles) includes forests, savannas, lava plains, swamps, erosion valleys, active volcanoes, and the glaciated peaks of the Rwenzori mountains. Virunga is home to about a quarter of the world’s critically endangered mountain gorillas. 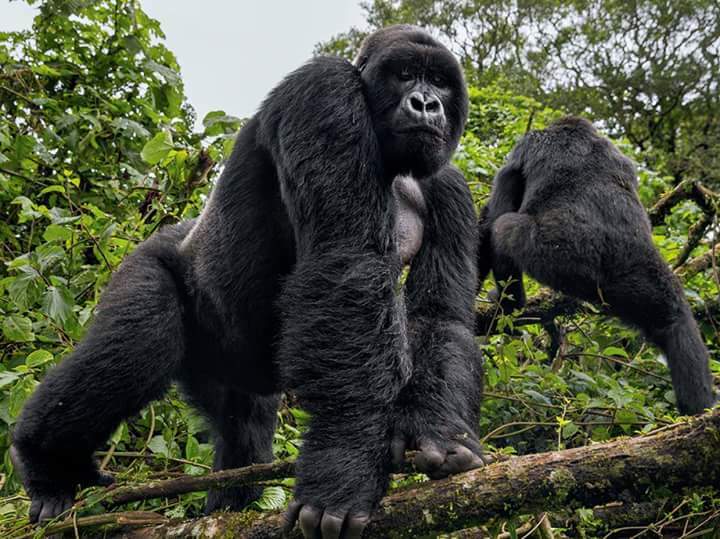 The park’s two other Great Ape species, eastern lowland Grauer’s gorillas and chimpanzees, make Virunga the only park in the world to host three taxa of Great Apes. Another prominent inhabitant of the park is the Okapi, an endangered species that looks like a zebra but is more closely related to the giraffe. Large colonies of hippopotami, forest and savanna elephants, lions, and numerous rare bird species can also be found in the park. Virunga National park is made of three sectors, The northern sector, central sector and southern sector. Rwenzori Mountains that border Uganda is one of the features of the northern sector of the park, Okapis can also be found living along the Semliki River in the northern sector of the virunga national park. At the central sector is the Lake Edward, the Ishasha river valley, and the Rwindi plains, those are the dominant geographical features that define the central sector. Lake Edward contains over 50 species of fish, as well as numerous bird species. The lake and the adjacent Ishasha river valley are home to the park’s recovering hippo population which was once the world’s largest. The park’s highest concentrations of elephant, buffalo, warthogs, and topi are found on the Rwindi plains which is in the central sector. The southern sector is mostly known for the mountain gorillas that live on the flanks on the dormant Mikeno volcano and the chimpanzees that habitat the forests. ← Amazing Mountain Attractions In China. Things to do and places to visit in Enugu. such an informative post, and beautiful pictures. great job! The park seems like a great place for adventurous hiking. It’s worth visiting. These pictures are amazing! This makes me want to visit sometime soon! How fun of a trip this must have been. That seems like a wonderful place worth seeing. Would hope to go there one day. Whoa! Virunga National Park seems way too exciting; full of history while still full of wild life thus a World Heritage site! The park is really rich in scenery now that the mountains and the lake Edward are just close there, not to forget the animals. I’d love to watch the mountain gorillas and hike in the mountains…would be such an adventure! Wow, this park looks amazing. So important to cherish and maintain sites like these for endangered animals. I love the look of this national park. I have never seen or heard anything like it before. My o my. I am African and i am sure so proud to be associated with such great and rich history and landscape. Such a beautiful place to explore.